Okay, these were supposed to be snickerdoodle cookies, but they taste more like donuts to me. 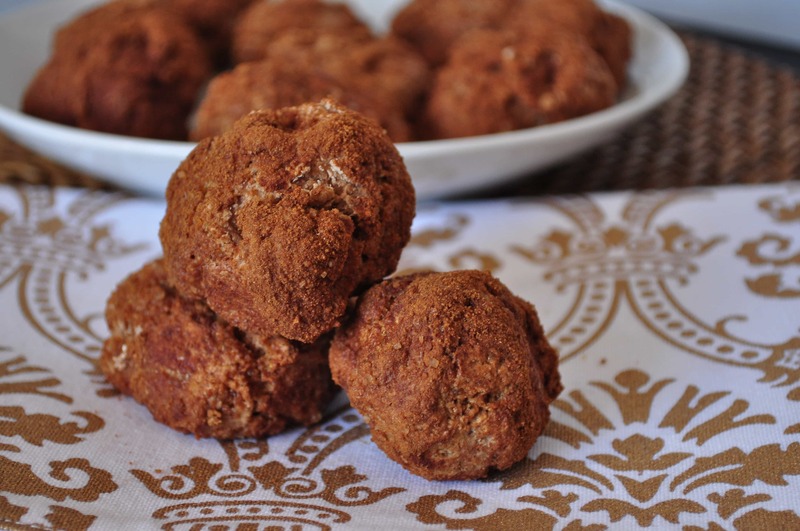 So….they are Snickerdoodle Donut Holes! These are pretty healthy compared to most desserts. They can even probably be eaten for breakfast. There is little fat, so feel free to enjoy more than one. I always do! Mix flour, baking powder, salt and 1/2 tsp cinnamon in one bowl. Mix yogurt, sugar, vanilla, milk and egg in another. The dough will be very sticky. With wet hands, form dough into balls and roll into cinnamon and sugar coating. Place on baking sheet and bake for 7-9 minutes. You used flax instead of egg. Can you explain how please? Would I use a cup of flax seed? I would like to make these for my son. Thank you! Melissa! You are on fire! I totally admire your dedication to such frequent posting! This recipe looks delicious and your refried beans AND fajita seasoning recipes look awesome! Your success (drawing lots of new readers) makes me so excited for you AND for the capability of blogs/internet/my blog to really teach people some things! Thanks so much for all of your hard work! Happy holidays! Sugar is not listed in the ingredients for the donuts but it is in the instructions to add with the yogurt and milk? Oh geez! I can't believe I didn't catch that. I need to fire my husband as a proof reader! :/ It's been fixed. If it seems like a lot to you, you can cut it a bit. These look really yummy. I made the somoas the other day and though it took a lot of time, they came out DELICIOUS. Probably one of the best desserts I have ever made and feel great eating them since they are healthy. Anyways, I's like to make these next but I don't have coconut yogurt. Would apple sauce work as a good substitute? I also have plain greek yogurt, would that taste weird? So glad you liked the Samoas! They do take a bit of effort. I used coconut yogurt because my daughter is allergic to dairy, but plain greek yogurt or applesauce would work too. Melissa, If I don't have coconut sugar, can I use a different sweetener? Maple syrup? Thanks! Sure! Maple syrup would be fine. You may have to slightly decrease the liquid elsewhere in the recipe though. I am just noticing these l! They look delicious!!! I love your peanut butter chocolate chip donuts. Could I substitute oat flour instead of spelt, thanks a million!!! I think you probably could. Maybe add an extra egg? This is a very old recipe. I haven't made in forever. Thanks for the reminder! I saw this recipe & your site for the first time last night, fun stuff! I made these this morning & they were a hit....my hubby ate about 2/3 of them before 10am! I used a bit of coconut oil (instead of water) to keep them from sticking while rolling the dough into balls. My son breaks out with wheat, but I tried a spelt bread last week & he seems to be just fine with it, so this recipe was perfect in many ways. Yum & thanks! Hi Amanda! So glad you enjoyed this recipe! I love spelt and it can be tolerated by some people that cannot tolerate wheat. Could I use almond flour? If so what else would I need to change so the consistency still comes out right?